Ten recipients of the annual New Jersey Historic Preservation Awards were honored at a ceremony on May 14, 2015 held at Monmouth Battlefield State Park visitor center in Manalapan, NJ. 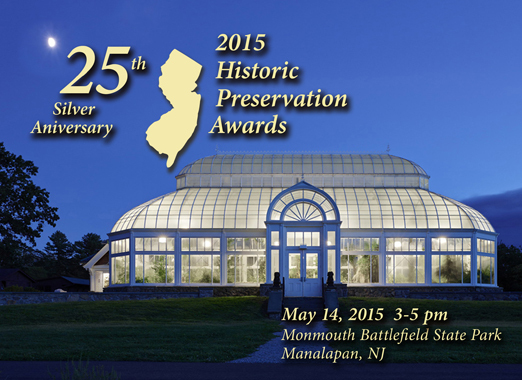 Celebrating May as National Preservation Month in New Jersey, the Department of Environmental Protection’s Historic Preservation Office and the New Jersey Historic Sites Council presented the competitive awards honoring projects, groups and individuals dedicated to preserving the State’s architectural and cultural history. This year marked the 25th anniversary of the prestigious awards. The award-winning 2015 candidates illustrate valuable historic preservation work on the national to local levels. They incorporate significant economic development, job creation and community reinvestment in some of New Jersey’s most urban neighborhoods and small towns. “These awards are our chance to honor the many who work so hard to preserve New Jersey’s historic places,” said, Dan Saunders, Administrator and Deputy State Historic Preservation Officer. “Dedicated professionals, developers, local officials, non-profits and private individuals are working in remarkable ways to preserve the design and architectural beauty of our older structures. Their efforts enhance everyone’s environment, and we celebrate their success. This is a success story of adaptive reuse of a significant historic home, combined with local community involvement and pride. Picture the Wright-Clark House in Newark’s Forest Hill Historic District, constructed in the early 1900s by one of the city’s most prominent industrial families. It was a symbol of opulence and architectural beauty. One hundred years later, it had become an example of a blighted and deteriorating landmark in a vital historic community. The City of Newark recognized the value of saving this important historic asset, and entered into an agreement with RPM Development Group to restore the Tudor-Revival inspired manor to its former glory. RPM organized a skilled development team of specialists to transform it into seven units of high quality, affordable rental housing. 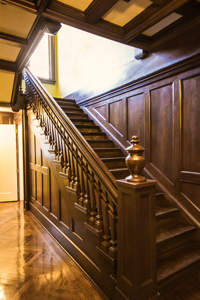 Much of the original material and framework was maintained, as well as original elements such as the windows, woodwork, decorative trim and the grand staircase. RPM also saw the value of community involvement in such a significant project, and purposefully worked with the City and local businesses to hire the residents to complete the renovations. As a result, the workforce consisted of 75% Newark residents and 96% minority workers, consistent with the local population. The project was completed just eight months after the start of construction, and will have a positive economic and community impact in Forest Hill.. The Darlington Schoolhouse needed restoration, and the New York-New Jersey Trail Conference needed a new headquarters. The Schoolhouse found its perfect match. 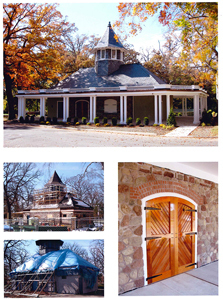 Built in 1891, the building was a gift to the citizens of Mahwah by Alfred B. Darling and Theodore Havemeyer. Designed in the Arts and Crafts Shingle style, local children attended classes there until the 1940s. The New York-New Jersey Trail Conference and Township of Mahwah purchased it in 2007 to become the Trail Conference’s headquarters. 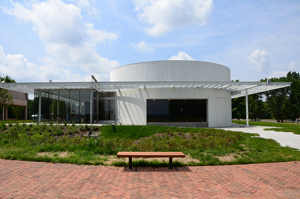 This unique example of 19th century architecture was restored and expanded in two phases for office space, an education facility, and visitors’ center. The first phase included structural stabilization, exterior renovation, climate control and utilities. The second phase involved interior renovations of the original 4,400 sq. foot schoolhouse and construction of a 3,700 sq. foot addition. All three of the Trail Conference’s objectives were met in this project. To preserve and return to active use, the Darlington Schoolhouse. To minimize the environmental cost of the Trail Conference headquarters in construction and operation. To create a convenient workplace that is enjoyable for Trail Conference employees, volunteers and visitors. Duke Farms is the magnificent 2,700-acre property created by James Buchanan Duke, a prominent industrial entrepreneur of the late 19th- and early 20th-centuries, which was later cared for by his sole heir and daughter, Doris Duke. Upon her passing in 1993, a philanthropic trust was created from her last will and testament to maintain and transform the property. The Doris Duke Charitable Foundation and the Duke Farms Foundation have developed an exciting vision and plan for the transformation of Duke Farms, providing the public with environmental stewardship programs, and increased access to the property’s unique cultural landscapes. The first step towards implementing this vision is the adaptive reuse of a monumental farm building – the Farm Barn – as an orientation center and Foundation offices. The renovation will allow for important areas of existing stonework to be exposed in the public areas of the first floor. Additionally, green design and ecological stewardship are priorities. This is reflected in energy efficient lighting and solar tubes aiding in energy reduction, roof rainwater collected in cisterns and used for flushing toilets, and bio swales and rain gardens aiding in the removal of suspended solids from motor vehicle runoff to improve groundwater recharge, and reduce discharge in Duke’s Brook. 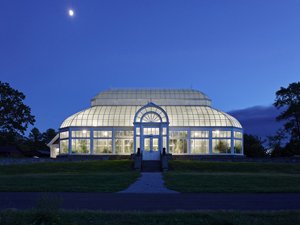 The second step is the renovation and renewal of the grand, 1899 Lord & Burnham conservatory – the Orchid Range – that houses indoor orchid display gardens, and a native plant center. Both of these projects have likewise received LEED-platinum certification. A true friend of historic preservation and downtown and community revitalization, The Hanini Group is a Newark-based development and construction management firm working in their own backyard. Their extraordinary investment in the City of Newark deserves particular distinction for the rehabilitation and adaptive reuse of myriad neglected, abused and abandoned buildings. Neighboring buildings on Edison Place, all located within the Four Corners Historic District. Several current projects focus on the James Street Commons Historic District’s neighborhood of University Heights. In addition, the former Hahne & Company Department Store, in the Military Park Historic District, is slated to soon become the city’s first Whole Foods market – bringing fresh produce and quality meats to the community. The Historic Preservation Commission of Paterson takes very seriously their mission of preserving Paterson’s historic resources in municipally-designated historic districts. This dedicated volunteer statutory body consists of seven regular and two alternate members. Their combined diverse qualifications and experience relate to historic architecture, building design, construction and materials, and history. Promotion of historic preservation in the municipality through stewardship and extraordinary public awareness functions. 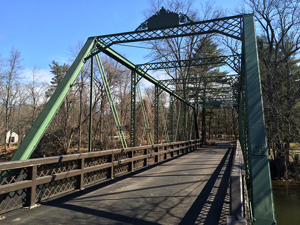 As an illustration of Hunterdon County’s commitment to historic bridge restoration, the Rosemont-Raven Rock Road Bridge rehabilitation in Delaware Township is a shining example. 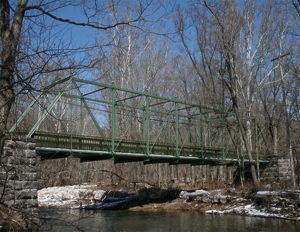 Carrying Raven Rock Road over the Lockatong Creek, this single span, wrought and cast iron, pin-connected, Pratt through truss bridge was erected by the Lambertville Iron Works in 1878 at a cost of $2,850. The bridge has been a landmark in the community for nearly 140 years. While experiencing physical deterioration, it was still considered an excellent example of its type, and technologically distinguished as one of the earliest, and most complete, bridges with Phoenix columns in New Jersey. The bridge is eligible for the National Register of Historic Places. While primary goals were to improve the physical condition and increase the low structural capacity, precedence was given to retaining original material when possible. For example, heat straightening/shortening methods were utilized, as well as, pad welding to repair the damaged truss members. Its retention and restoration offer a renewed sense of place, continued focus of local pride, and an example of the benefits of historic bridge restoration. A second excellent example of Hunterdon County’s commitment to historic bridge restoration is the recent completion of the Stanton Station Road Bridge (aka No. RQ-179) in Raritan and Readington Townships. This historic eight-panel, pin-connected, Pratt through truss bridge was constructed in 1880 by the Cleveland Bridge & Iron Company. It is eligible for listing on the National Register of Historic Places. The single-span truss was supported on random ashlar abutments, and is notable for its built-up, fish-belly floor beams and ornate maker’s plaque. Due to its notable character, historic research, field investigation, measurement of structural details and surveys were required to complete this project. The primary goal was to improve the bridge’s structural deficiencies via sensitive structural repairs that would not alter the historic components or context of the original bridge design, in accordance with the Secretary of the Interior’s Standards for the Treatment of Historic Properties. Rehabilitation improvements included an increase in load capacity through replacement of, and repairs to, the original wrought iron members. Historically accurate treatments were achieved, preserving the integrity and historic appearance of the original structure, engineering significance and functionality of the 135 year-old structure. Two distinctive landmarks in the heart of the City of Paterson have been nominated to the New Jersey and National Register of Historic Places. These nomination documents represent the first step of ensuring the Passaic County Court House, built in 1904, and the United States Custom House and Post Office, built in 1899, retain their architectural and cultural integrity. 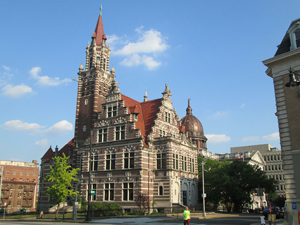 Both buildings are considered significant under Criterion C.
The United States Custom House and Post Office is an excellent example of Flemish renaissance revival style architecture, and the Passaic County Court House was designed in the late Italian renaissance revival style. While they have not escaped various renovations through the years, the State Register Nomination serves as a tool that both outlines and celebrates the physical features and historical qualities that make these buildings worthy of thoughtful planning, preservation, and rehabilitation. The Paramount was originally built as a nurses’ dormitory within the former Jersey City Medical Center. Constructed between 1928-1941, the 12-acre hospital complex consists of ten high-rise buildings. It is the largest and most cohesively planned Art Deco complex in New Jersey, and is listed on the New Jersey and National Registers of Historic Places. The medical center is an early example of a specialized architectural type, and was a major public works project for over 20 years. The complex was purchased in 2004 by a New York-based developer; then sold to Building and Land Technology, Inc. in 2011. 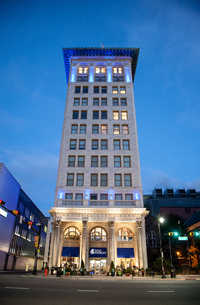 The Paramount is the sixth building to be restored, and the building exterior, and the historic first two floors, are protected by a historic preservation easement. 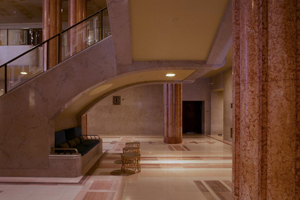 It contains the most elaborate interior of any of the buildings, combining Art Deco detailing with International Style planar surfaces. It has been adaptively reused as market-rate housing with 231 apartments, and was rehabilitated using the Secretary of the Interior’s Standards for Historic Preservation. The Red Mill Museum Village, founded in 1963 as a non-profit, educational institution, is listed on the National Register of Historic Places. The Mill building, in operation from 1810-1928, was originally a woolen mill before being converted into a grist mill in the middle of the 19th century. However, the Village contains several buildings in addition to the iconic mill, one of which is the Screen House. 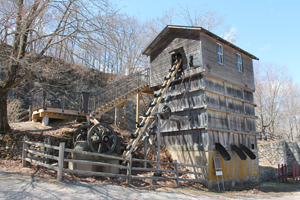 It is a tall, compact frame structure that served as a crushed stone sorter during the complex’s quarry operation period which began in 1848. The building is a key source for interpretation of the historic site as it contains the majority of its equipment, but it had not operated in over a half century. Due to deterioration, it was deemed unsafe along with its access stair by the local building department and was closed to the public. 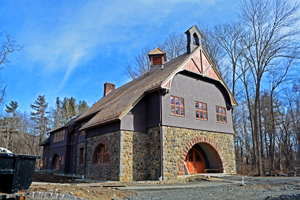 The Red Mill Museum Village and Eclectic Architecture, LLC formulated a plan to re-open the building to the public, and to get the mechanical components moving again. A new exterior stair was designed and reconfigured in a way to make it minimally intrusive as well as code compliant. In addition, the opportunity was taken to use the lower landing as an observation deck. Rehabilitation of the mechanical equipment included the introduction of an electric motor connected to a keyed switch, which allows staff to operate the mechanics from the screen observation deck while supervising visitors. This innovative plan to rehabilitate the mechanical system and building has created an exciting, dynamic and interactive exhibit. Visitors are now treated to a memorable educational experience, and the Screen House is a focal point for the historic industrial site. For his extraordinary dedication to the historic development of the Monmouth Battlefield State Park.